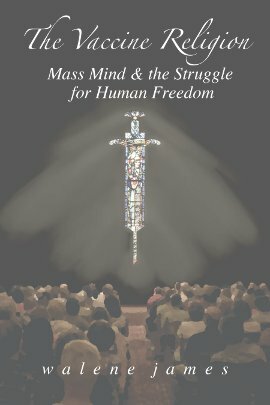 The Vaccine Religion: Mass Mind & the Struggle for Human Freedom by Walene James is a high quality paperback, referenced and indexed, 279 pages. The founder of Vaccination Liberation has written another powerful book on vaccines that combines the paradigm shifting information from her first vaccine book, Immunization: The Reality Behind the Myth, with even more insights into the societal trance of disease-scare. This book effectively dispels the myths of herd immunity, the germ theory of disease and the current 'one size fits all' mass vaccine program aggressively promoted to an ignorant public through the CDC and their state health department minions. Due to the persistence of the "Vaccines eradicated smallpox and polio" myth today, pharmaceutical companies now have free rein to develop a drug for every bug and a pill for every ill. The Vaccine Religion exposes this erroneous mindset by retracing the real history of both smallpox and polio from relatively unknown historical sources. Walene also challenges the reader to take responsibility for their health through a more holistic understanding of dis-ease while discovering what creates true immunity and health. Being a former English teacher, Walene's engaging writing style makes The Vaccine Religion a fun and compelling read. This book is guaranteed to take the reader from viewing vaccines as a micro issue to the most important health freedom issue we face today. When Professor of Pediatrics and best-selling author, Robert Mendelsohn MD, described her first book as "the most valuable gift you can present to the mother of a newborn baby", he was echoing the thoughts of many who 'discovered' the controversy lurking behind vaccination through Walene James' ground-breaking work, "Immunization: the Reality Behind the Myth". Now the author presents her second and final volume on the issue - "The Vaccine Religion". Walene James passed away in August 2012, shortly after this book was published. Penned 10 years previously, it exposes the mindlessness which chains many of us politically, socially, emotionally, morally, and even spiritually, to a procedure which started out as a middle-age superstition, and grew into what some consider a horrendous thorny bush sitting uncomfortably at modern science's side. Those who have previously investigated this issue will know that vaccination is exhibited on the one hand as a cut and dried example of scientists in unanimous and triumphant agreement, while, on the other hand, it is guarded ferociously from dissenting voices. Discussion is actively stifled. It is a procedure which science can neither explain satisfactorily, nor produce robust evidence for. In fact, believers have ruled that vaccines are not to be tested via the rigorous randomised controlled experimental standards which apply to other treatments. In this book, the author transcends the 'debate' and sheds a new light. Readers explore the belief system that keeps the practice alive. The fear which feeds the need for such a belief, the exploitation of this fear, and the way in which we are all recruited as willing soldiers in the 'mission', are all examined. Thoreau said, "There are a thousand hacking at the branches of evil to one who is striking at the root". In this book, James guides us from mindlessness to mindfulness; from mass-mindedness to individual and responsible growth. This is the real issue. For those who feel there is no scientific justification for continued belief in vaccines, this is the only remaining issue. To understand why it continues we must understand our collective emotional needs, as well as the societal and commercial forces that operate at various levels. Only then can we map our way out of the quagmire we have fallen into with vaccines.